Want a creamy and delicious pasta meal on the table in under 15 minutes? 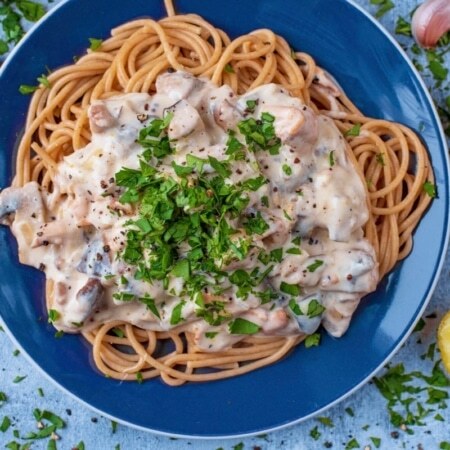 This Creamy Mushroom Pasta not only tastes far more indulgent than it actually is, but it’s quick and simple to make. A great date night meal that will impress, without you having to spend a lot of time in the kitchen. 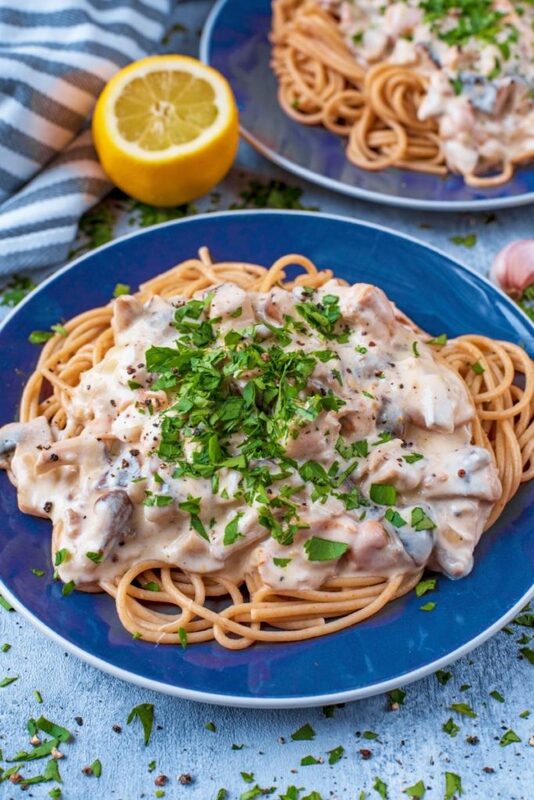 Creamy garlic mushrooms on a bed of pasta and topped with fresh herbs. Mushrooms have a really meaty texture, so they are the perfect ingredient for a vegetarian comforting meal. Mushrooms and garlic are a delicious flavour combination and a winner when it comes to a quick and easy pasta dish that packs a punch in the taste department. Want to add even more flavour? A drizzle of truffle oil, or a sprinkle of truffle salt just before serving will really make this dish pop. A little goes a long way though, so use it sparingly. A pasta dish just isn’t fully comforting unless it’s creamy, am I right? We have made this dish taste far more indulgent than it actually is by using half fat creme fraiche rather than cream and butter to make a sauce. A little bit of cheese makes it even creamier, but without adding too many extra calories. Mushrooms have a naturally creamy texture anyway, so this is a creamy dish that is still nutritious too. 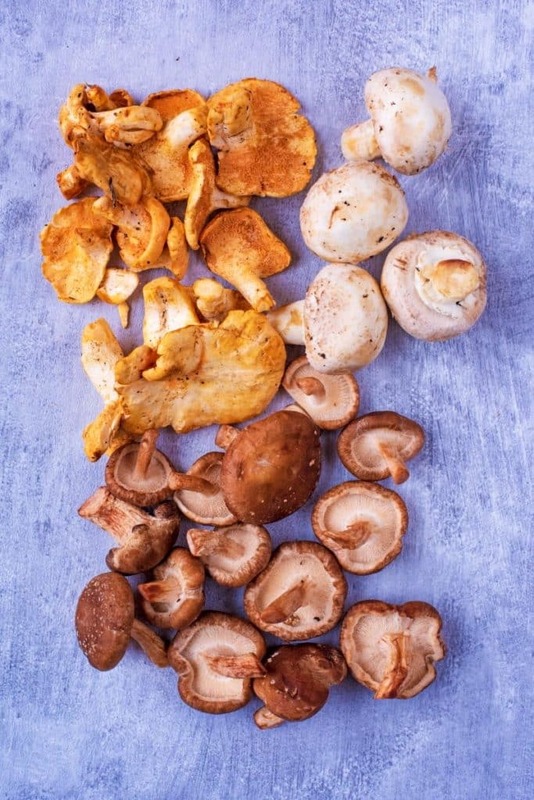 The key to mushroom dishes is using a variety of mushrooms for different textures and flavours. If you want to keep this recipe budget friendly, then stick to the cheapest kind of mushroom. But, if you want to take this to the next level, use a mixture such as button, mini portobello, shiitake and oyster. 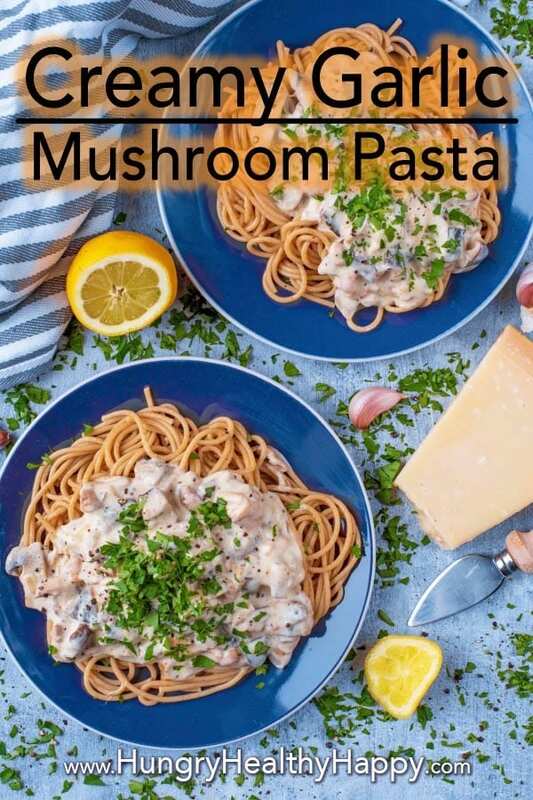 Mushrooms are a good ingredient for a vegan pasta dish and this is easy to make vegan by using an oat based creme fraiche and a vegan parmesan alternative. A sprinkle of nutritional yeast would be really good on the vegan version of this. We kept it simple and spooned this sauce on top of some spaghetti, but there is so much more you can do with it. Put it on top of rice or use as a pizza base or on chicken for a low carb meal with some extra vegetables. Can You Freeze This Pasta Dish? This isn’t the best dish to freeze as the sauce can separate when defrosted and reheated. But, it’s really quick and simple to make, so it is best made from fresh. One: Add the spaghetti to a pan of boiling water and simmer for 12 minutes. Two: Heat the oil in a frying pan and add the shallots, garlic and mushrooms and gently cook for 3 minutes. Three: Stir in the creme fraiche, parmesan and lemon zest, stir and simmer for a minutes. Four: Drain the pasta and top with mushroom sauce, black pepper and parsley. If you want to add some extra protein, you could grill some chicken, chop it up and stir it in to the finished sauce. Add some extra greens by stirring in some spinach a couple of minutes before the sauce is cooked. A little bit of truffle oil drizzled over the finished dish adds loads of extra flavour and makes it a bit more special. Make this recipe gluten free by swapping the spaghetti for your favourite gluten free pasta. Use a variety of mushrooms to add plenty of different textures and flavours. This dish is best made from fresh as the sauce can separate when defrosted and reheated. 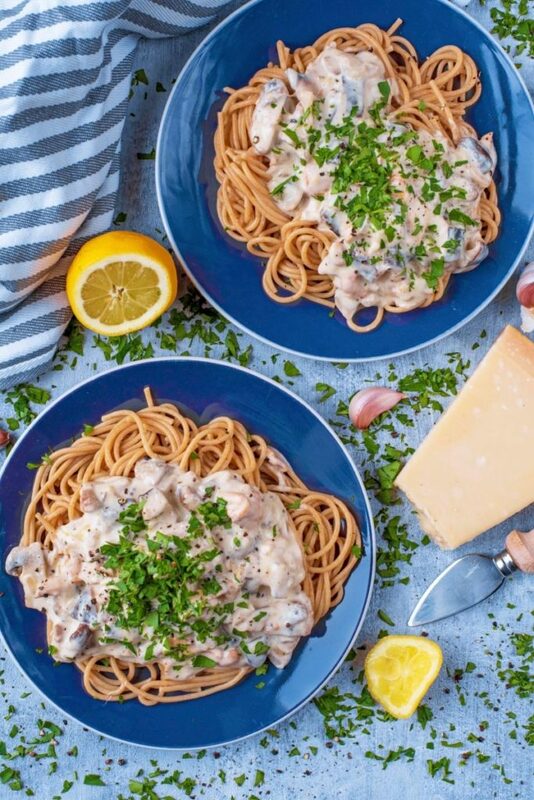 If you’ve tried this Creamy Mushroom Pasta, or any other recipe on the blog, then let us know how you got on in the comments below, we love hearing from you! You can also FOLLOW US on FACEBOOK, TWITTER, INSTAGRAM and PINTEREST to see more delicious recipe ideas, behind the scenes shots and also what we are getting up to. The quicker a meal can be prepared, made and put on the table, the better! 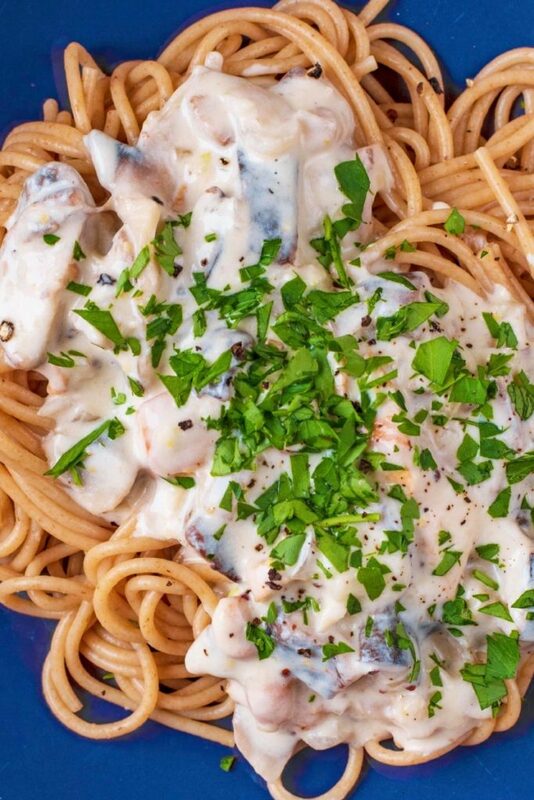 This Creamy Garlic Mushroom Pasta is exactly that. Add the spaghetti to a pan of boiling water and simmer for 12 minutes. Heat the oil in a frying pan and add the shallots, garlic and mushrooms and gently cook for 3 minutes. Stir in the creme fraiche, parmesan and lemon zest, stir and simmer for a minutes. Drain the pasta and top with mushroom sauce, black pepper and parsley. I have been searching for a great vegetarian meal for a long time, have tried a lot of recipes and after this one I can finally say that I had an awesome vegetarian meal! I am very busy these days, that’s why I especially like recipes like these because they are very easy and convenient to prepare, it takes just 15 minutes. I was also pleased by the clear instructions of the recipe because of your step by step explanation. Because I liked the recipe that much, I wanted to prepare it for my family. Not everyone likes the vegetarian kitchen that much, but I wanted to convince them with this recipe and it was definitely a success! Everyone was surprised of the good taste. Thank you for your inspiration! I can totally recommend to everybody who wants to try! I am so glad you enjoyed it – it’s one of our favourites too. I love the recipe. I’m a pasta lover, especially creamy pasta. I love how you used different types of mushrooms. I’ve made this dish myself a few times, but only with one type of mushroom. I always felt like something was missing whenever I made it, now I finally know what it is, thanks to you. I will definitely try it with a big variety of mushrooms next time, and with next time I mean tonight.. I love this recipe because it’s super easy and very quick. I will definitely get creative and add some chicken. 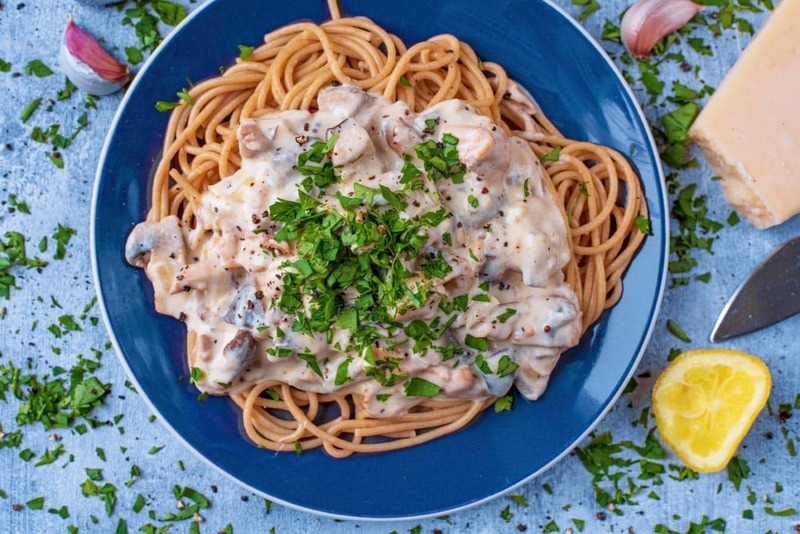 You can’t go wrong with creamy pasta and chicken. The variety of mushrooms really makes such a difference to the dish. 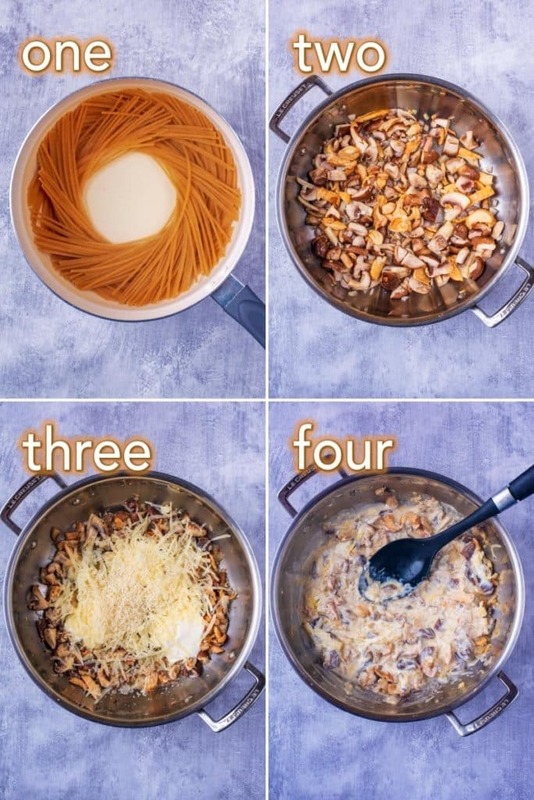 I am a pasta lover myself, that’s why I tried this recipe. I really liked this recipe! The mushrooms give the pasta an innovative taste. It is definitely not an easy recipe, but certainly worth making. While making this recipe I added shrimps, this was my best idea ever. This gives you a fresh taste of the mushrooms and a heavier taste of the shrimp. These 2 flavours go very well together. But actually you should not even add anything because this recipe is already super tasty. So,now I know what I’m going to cook tonight! I am so glad you enjoyed it. I never would have thought to add shrimp, but I am definitely going to try that next time. I love pasta very much and I have a big book with many different recipes in it, I’m glad that I can add another one!! The mushrooms make the pasta, together with the herbs, absolutely complete. Although it is quite a lot of work, it’s definitely worth. Everyone should give it a try! I also think that I find a way to make it even better ;-). Onions and mushrooms are often used togehter in recipes so why not here? Of course you don’t have to do this if you don’t like onions, but it is just a tip. So now I made myself hungry with talking about it, and I think that I already know what to make! Pasta is my favorite. Your pictures looks soooooooooooo good! Can’t wait to try it by myself!! Tried this the other night, and I was so happy I did! Love the recipe! Your blog is a great source for these, really appreciate you sharing these amazing recipes with us. Pairing meals like this with the right stuff is how I lost 40lbs in 3 months. Truly, love the work, keep it up! Oh I could eat this right now!! Love mushrooms and this is a great healthy take on the usual creamy, fat laden mushroom dishes. I’d have to substitute the mushrooms as I really hate them, but that dish looks lovely – love the photos too! This is a great date night recipe! Creamy + Garlic, ummm that in itself sounds amazing, and throw in the pasta?! SIgn me up! I love mushrooms so this is perfect for me really. That looks tasty, sure would love to try that. btw, thanks for sharing the recipe.